It certainly took a while for this sequel to come out. In preparation I recently rewatched the first title and a review for that one will be coming fairly soon. Unfortunately, Resurgence isn’t quite as epic as the original and has more wince-worthy scenes….not to mention a lot more plot hax. This is always going to be the result when you make the villains absurdly powerful though. It’s good to keep them within reasonable striking distance. Still, Resurgence is still a good film, but it certainly can’t be called a great one. 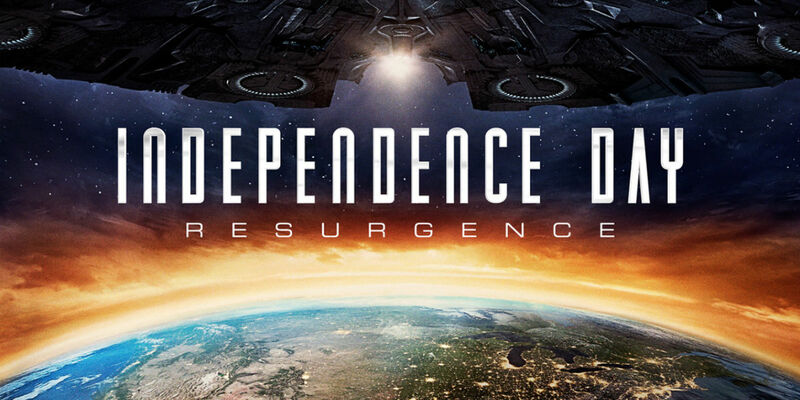 I think that the third film could reasonably beat this film if it gets made, but the series is certainly not going to feel like Independence Day anymore. The first film really captured the heart and depth of what this franchise was all about. It has been 20 years since America defeated the Mothership and the rest of the countries allied together to stop the aliens. Now, they have finally returned and everyone who was connected to the aliens at one point in time can hear their telepathic presence. This wakes up one of the scientists from his 20 year coma and gets the old President back into action. The only problem is that nobody believes the former President until it’s too late and the aliens have returned. They quickly destroy a city and cause some massive damage. The heroes will have to do what they did last time and destroy the Alien Queen. If they can do that, then order will be restored to the universe. It’ll be significantly more difficult this time though since humanity has realized that sending a virus through a Mac is very tricky and won’t work a second time. We’ll need a more physical approach. As you would expect, the special effects are quite good. As it is, the first film looked great for its time and this film shows how much our graphics have improved. The aliens can actually be seen without the smoke covering them all the time. We don’t get any visuals that are quite as powerful as seeing the White House get obliterated by a giant laser, but there are some homages to that moment. There are a lot of homages in general although they don’t work too well for the most part. The new version of “There will be no peace” comes off rather badly as the character who is saying this doesn’t say it in a commanding voice. Not to mention the fact that it probably wasn’t a great situation in which to say the line. There are some retcons here as well. The scientist character was definitely dead in the first film. In this film they retconned the neck choke a little to say that it is purely just to talk to humans through the vessel rather than destroying someone and creepily saying stuff. The film pushes this point by having the alien do this against another opponent as well. It’s too bad because the scientist is a pretty bad character. In the first film his role was rather small so he didn’t get to grate on your nerves quite as much, but his role is definitely bigger this time around. He’s also completely used for comedy this time and results in most of the unfortunate humor moments that I had hoped to avoid. Another weakness in this film is naturally the romance. The film justifies a “classic” love at first fight plot which is really terrible. On one hand we have the typical flirt who tries to go with everyone, but they all reject him. This time will be different he thinks as he likes an ace pilot who also loses someone rather close to her so he quickly takes this opportunity to show off and win her over. It’s sadly very successful as everyone in the theater probably predicted the instant that she first appeared. It really undermines her character to go with him so easily. We also have the romance with the main lead, which has no real point to being here. Resurgence also takes itself a little too seriously at times with quite a few tearful goodbyes and characters barely holding it together as they give out a speech. Given that the film is constantly throwing comedy moments at you, these scenes don’t work well. Not to mention that so many characters die during the film in very sudden scenes that there is no real time to feel sad. The heroes just go back to joking right away anyway so the film doesn’t even take its own serious moments all that seriously. My final complaint lies with the writing. The previous complaint is more or less related to this as well. Most of the characters are just written very badly. The main character is a good example of this. He’s supposed to be the tough and charismatic leader that everyone loves during the film. He breaks the rules and always ends up saving the day. Being grounded for saving dozens of lives after a tech malfunction was laughable so I don’t blame him there. Still, his “big” moment where he insulted the aliens was very bad. There are a lot of ways to have a cool moment without just being vulgar. Unfortunately, the crowd did laugh and cheer a bit during this moment. I got a very active crowd, but they help to remind me why these bad moments won’t end. Everyone always cheers at the moments where they are supposed too. Directors and Producers love this kind of crowd because they go along with just about everything. Crowd mentality is strong so a lot of people naturally just get taken in by it, but it also means that these kind of scenes will be sticking around for the long haul. It’s regrettable. Back to the writing though. Towards the end of the film, a big point of emphasis is that all of the dozens/hundreds of alien ships are protecting the Alien Queen. That’s their whole purpose and yet, they sit by and just watch as the heroes attack her for minutes upon minutes. That was just terrible writing. The writers put themselves into a hole that they couldn’t get out of so they had to just throw logic out the window. It’s a shame. Still, the Alien Queen was cool and the armor that the aliens used was pretty neat. I’m not sure about them losing to a guy with two swords and a comic relief assistant with a blaster though. That seemed like a bit of a stretch. All right, let’s look at the positives. The soundtrack was pretty solid. We had some pretty nice themes and it helped to carry across the film’s epic vibe. It was mitigated by the futuristic Earth that no longer looked like ours and the fact that you can never top the original Alien incursion. Still, it was cool to see the alien fleet arrive. I also think that it was good to finally see Earth shoot first when the aliens appeared. It was rigged this time, but I’d say that we made the right move. The film started out quite rapidly even if it slowed down quite a lot after that. David was one of the big characters from the first film and he’s still really solid here. His romance with another scientist is terribly written, but beyond that he is a good character. A lot of his scenes are humorous, but in a good way as opposed to the majority of the other characters. I do disagree with some of his decisions like the “wait and see” approach, but on the whole he was smart and came up with his own ideas. He wasn’t a yes man the way that some of the scientists and government workers were. His dad was also a pretty fun character like in the last film. He gets less screen time here since his plot gets the shaft much like the driving plot in the first film. That’s probably a good thing if you ask me although it was fun seeing the dog stand up to the aliens. This puppy meant business and thanks to the Dad, the kids who were along for the ride will never forget this day as they got to meet some really important figures. Thomas, the former president, was another solid character. It’s a little unfortunate that he is seen as a crazy guy on meds now instead of the world remembering him as an awesome guy. Although, the general public may not be aware of this and only select members since he does still get a lot of attention. People should be taking him seriously considering how well he did in the first film. Also, is it just me or did he look different in the flashback to the first film? I highly doubt they would have re filmed the speech for such a short clip so it must have just been my imagination. Thomas stepped up to the plate when the chips were down and turned out to be someone that the rest of the world could count on to fight the aliens. Being attacked telepathically may have weakened him, but he’s still the same likable character that he always was and is easily the best character in the film. Even though I recently saw the first film (5 days before watching this one) it was a little hard to keep track of all the characters. I wouldn’t call it confusing as you know who everyone is in the context of this film, but as far as the homages and wink-wink moments at the audience go, I probably missed a few. The army guy sounded familiar, but I couldn’t place him. The character who was with David as a rival also felt like she came out of nowhere, but maybe she was actually one of the characters from the first film. Ah well, I suppose that a film like this one is supposed to have a huge cast. Perhaps it should have thought about getting rid of a few excess ones though. Two characters who didn’t go over well were Jake and Dylan. It goes without saying that I didn’t like the comic relief, flirting sidekick, the two scientists who crossed the bridge of being quirky to over the top so those are already in the pile. The “tough” heroine who was the grand daughter of the army general was also destroyed the instant that she didn’t shut down the comic relief guy. Jake could have been cool since I like the tough rebel type of main character, but he goes a little too far as well. His plot of nearly destroying Dylan a while back wasn’t really handled well either. Dylan doesn’t come across as likable either for the fact that he held a grudge against Jake for so long and got a sucker punch in and then cracking when the chips were down. Sure, the two of them get along very well after a few minutes and it’s back to normal, but it was hard to recover from that so easily. I don’t blame Jake for saving lives after a mechanical malfunction since I didn’t think it was his fault in the first place, but that’s about all the credit I can give him. As mentioned before, the action scenes are great though. The film also never drags on even though it’s around 2 hours. The pacing is good and I never thought that any of the plots were particularly boring. Some were fillerish, but at least things were still happening. The drunk fellows blackmailing the world for 100 million was one of those “interesting” plots that actually worked out pretty well though. They were certainly bold even if they didn’t do much. Seriously, that was probably the easiest 100 mil that they ever earned. All they had to do was keep drinking while keeping an eye on the equipment. I won’t talk about the plot for the next film much, but the film does take a big turn. It’s hilarious for the wrong reasons though as someone talks really tough, but if you actually think about what she’s saying…then you’ll realize that they made all of the wrong decisions. I can’t say much more than that, but it’s intriguing. We could very well be going to Star Trek/Star Wars a lot sooner than we thought and I can picture other alien languages being spoken soon and intergalactic bars. Nothing is out of the question now and whether that is a good thing or not…we will find out soon enough! Overall, Resurgence is a fun film, but one that does have quite a few problems bogging it down. For every good character there was a bad one and for every epic scene there was a wince worthy one. The topsy turvyness of the film is what keeps it from getting a really good score. Hopefully the sequel will be able to improve on this. At the very least, the action scenes and effects are quite good. I expect them to get even better with the next film. It’s definitely an ambitious plot line going forward and I can definitely see a lot of Star Trek comparisons coming out soon. The third film has the potential to be a completely different experience so I hope that the writers are ready for the challenge ahead. I’m not sure how much confidence I have in them after this though. This entry was posted in Live Action Movie Reviews, Live Action Movies, Reviews and tagged Action, Aliens, Blockbuster, Film Review, Independence Day, Independence Day 2 Resurgence, Jeff Goldblum, Liam Hemsworth, Movie Review, Review, Roland Emmerich, Sci-Fi, Thriller by dreager1. Bookmark the permalink. Gotcha, I’ll put these in.